ROBERT V. WALLACE, Trustee of Columbia-Hanover Realty Trust vs. PLANNING BOARD OF HANOVER. Robert V. Wallace, Trustee of Columbia-Hanover Realty Trust, the plaintiff, appeals pursuant to the provisions of General Laws, chapter 40A, § 17 from a decision of the Planning Board of the Town of Hanover, the defendant, in failing to approve the site plans submitted by the plaintiff and covering the plaintiff's parcel of land situated on Columbia Road (Routes 53 and 139) in Hanover in the County of Plymouth. A trial was held at the Land Court on July 2, 1987 at which a stenographer was appointed to record and transcribe the testimony. Nineteen exhibits were introduced into evidence, some of which had multiple parts consisting of photographs of the area. All exhibits introduced into evidence are incorporated herein for the purpose of any appeal. The plaintiff, Robert V. Wallace, Christopher Sheedy, an employee of H. W. Moore Associates, Inc., who conducted a traffic count at the locus, Franklin D. Ching, an expert witness who is the Vice President of the latter corporation, and Azu Etoniru, an employee of Briggs Associates, Inc., who designed the site plans, testified on behalf of the plaintiff, and John A. Libertine, Chairman of the Hanover Planning Board, testified for the defendant. 1. The plaintiff is the owner of land shown as Lot 1 on a plan entitled "Subdivision Plan of Land in Hanover, Plymouth County, Mass. Owned By Oman Realty, Inc., Weymouth, Mass." dated March 15, 1965 by Gale Engineering Company, Inc., and recorded with Plymouth Deeds [Note 1] as Plan No. 693 of 1965 (Exhibit No. 3) conveyed to him by Anthony M. Viola, et al, Trustees, by deed dated July 15, 1985 and recorded with said Deeds in Book 6238, Page 286 (Exhibit No. 7). The site presently is vacant land with a car wash situated on land adjoining to the north, and a Ruderman's Furniture Store and a D'Angelo's abutting to the south and west on the opposite side of the lot. Two sets of photographs introduced into evidence (Exhibit Nos. 2A-H and 19A-G) show the nature of the neighborhood to be a very concentrated retail development, and the proximity of the Hanover Mall, Route 3 and Route 139 as well as the convergence of the town lines of Marshfield, Hanover and Pembroke, rapidly growing South Shore towns, contribute to the traffic, particularly during commuting hours. 2. The deed grants to the plaintiff a non-exclusive right to use the 40 foot right of way over Lot 2, and the grantor reserved a like easement over the granted premises, all as shown on the 1965 plan. 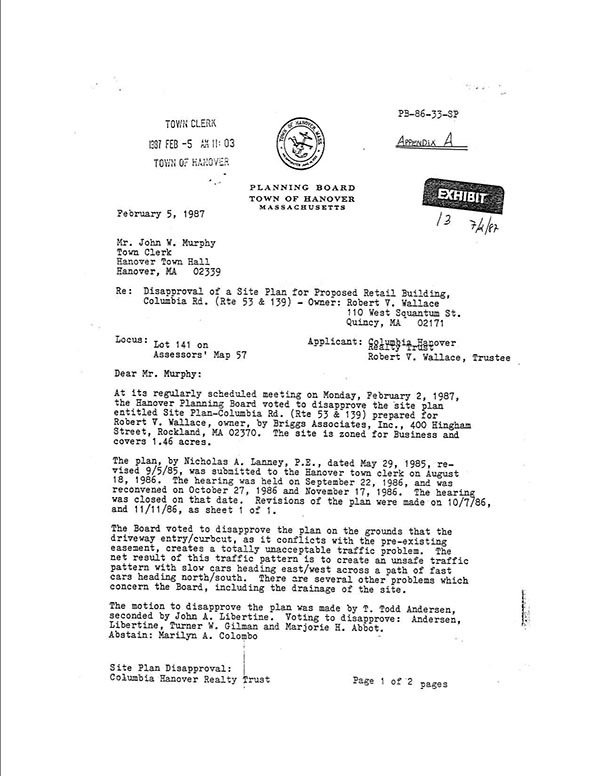 The easement originally was granted and reserved in a deed out in 1965 when Francis G. Oman, Trustee of Oman Realty Associates Trust, conveyed to Sincha Dubitzky, Lot 2 on the subdivision plan by deed dated August 5, 1965 and recorded in Book 3233, Page 103. 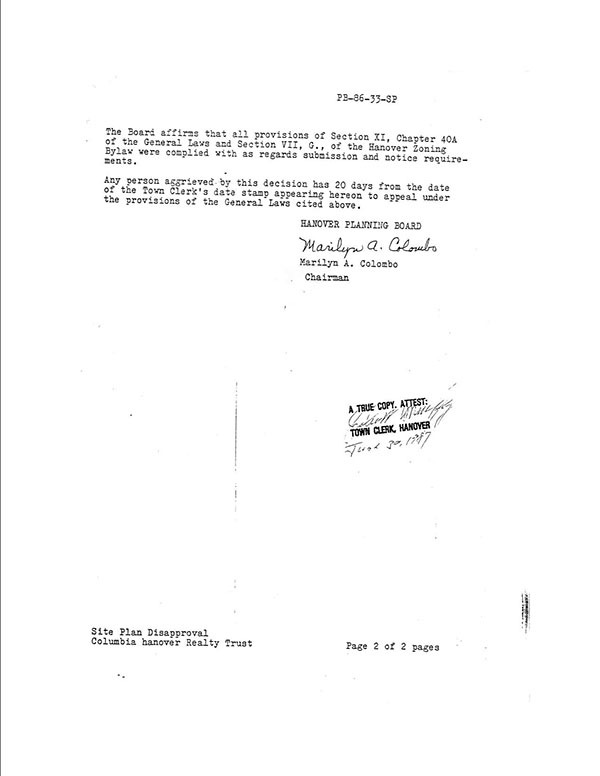 The 1965 deed granted a right of ingress and egress to pass and repass in motor vehicles or on foot over the 40 foot right of way on Lot 1 to and from Columbia Road as appurtenant to the granted premises and reserved a similar right of way over Lot 2 (Exhibit No. 4). 3. Lot 1 is situated in a Business District as defined by the Zoning By-Laws of the Town of Hanover (Exhibit No. 1) and the use which the plaintiff intends to make of the locus is permitted as of right in the Business District. b. The use and ownership of adjacent land and the location and use of any buildings thereon within two hundred (200) feet of the boundary of the subject property. c. All existing and proposed buildings, structures, parking spaces, driveways, driveway openings, loading areas and service areas on the	subject property. d. Provisions for screening, surfacing, lighting, landscaping (including fences, walls, planting areas and walks) and signs. e. Provisions for waste disposal, drainage, dust erosion control and other utilities. 1. The relationship of the proposed development to flood plains, ground water, recharge areas, the water table, municiple (sic) water supply impoundments and to the ability of the water supply system to fulfill the additional demand generated by said development. 2. Existing traffic volume, composition, peak hour levels and street capacities and an estimate of overall average daily traffic generation, composition, peak hour levels and directional flows of the proposed development. a. Protection of adjoining premises and the general neighborhood from any detrimental impact resulting from the use of the subject property, including but not limited to, the creation of a nuisance by virtue of noise, odor, unsightliness, or vibration. b. Convenience and safety of vehicular and pedestrian movement within the site and	relation to adjacent streets, properties, or improvements. c. Adequacy of the methods of disposal of sewage, refuse and other wastes; and of the methods of drainage of surface water; and protection of wetlands, watersheds, aquifers and well areas and the potential harm to same from the use, storage or disposal of any substances which could enter the water supply or wetlands. d. Provision for off-street loading and unloading of vehicles incidental to the servicing of the buildings and related uses on the subject property. e. Compliance with the provisions of the Zoning Bylaw of the Town of Hanover. There also is a provision in paragraph G for the procedure to be followed and in that procedure is a requirement that "[t]he Board shall act within ninety (90) days of the public hearing held under this Section VII, G. or the application shall be deemed to be approved." 4. The plaintiff filed three site plans with the defendant Board. The first site plan, entitled "Site Drainage & Grading Plan for Proposed Retail Building, Columbia Rd. (Rte. 53 & 139) Hanover, MA, Owner: Robert V. Wallace" dated May 29, 1985 by Briggs Associates, Inc. (Exhibit No. 6), was filed with a site plan application, dated August 18, 1986 and date-stamped as received by the Town Clerk on the same day (Exhibit No. 5). Site plan No. 1 incorporated the existing driveway from Columbia Road to Lot 1 and Lot 2, the adjoining property to the south. A public hearing was held on September 22, 1986 to consider the site plan application. At the hearing the Planning Board objected to the effect on traffic of the existing easement which permitted access to and egress from Lots 1 and 2 over the 40 foot right of way and circulation from the existing curb cuts within Lot 1 and Lot 2. Some members of the Board took the position that it was preferable to have each lot served separately by its own entrance from the state highway and suggested that the existing drive be relocated closer to the southerly property line. The hearing then was continued to October 27, 1986 when a second site plan (Exhibit No. 8) was considered. This plan, dated October 7, 1986, shows the existing curb cut in the location shown on site plan No. 1 and a proposed location much closer to the southerly property line. The Board considered site plan No. 2 and suggested that the entrance from the state highway be relocated to a position fifteen feet northerly of where the curb cut appears on site plan No. 2 so that provision might be made for lot line plantings if the easement were terminated. Site plan No. 3, also bearing the date of October 7, 1986 (Exhibit No. 9), was then prepared and was considered by the Board at the adjourned hearing herd on November 17, 1986. The Board voted to disapprove the plan on the grounds that the driveway entry/curbcut, as it conflicts with the pre­existing easement, creates a totally unacceptable traffic problem. The net result of this traffic pattern is to create an unsafe traffic pattern with slow cars heading east/west across a path of fast cars heading north/south. There are several other problems which concern the Board, including the drainage of the site. 6. The traffic count conducted by the firm engaged by the plaintiff and made between the hours of 4:00 P.M. and 7:00 P.M. on a sunny Thursday afternoon in June (i.e., June 11, 1987) showed the high volume of traffic on the state highway (Exhibit Nos. 16 and 17). Traffic entering and leaving the locus, however, which is presently vacant land, but which affords access to the adjoining property on which there is situated a large furniture store and a restaurant, is also served by the existing driveway. During the period in question, fifty-nine vehicles, of which fifty-six were cars and three were buses, entered from the north and turned right onto the site, and one car entered from the south. In the same time frame twenty-three cars left the site, and all but one of them turned left. Between 4:30 P.M. and 5:30 P.M., 1,316 cars and nine heavy vehicles passed the site in a southbound direction. 7. Dr. Ching, an expert in the field of traffic information, testified about the adequacy of the three site plans from the traffic point of view. He recommended the continued use of the existing entrance from the state highway which curb cut was previously approved by the Department of Public Works and has been in effect presumably since 1965. However, he suggested the installation of a so-called "gum drop" island therein which would require motor vehicles leaving the site to turn right into the deceleration lane there joining other slow-moving traffic desiring to make a right turn into the adjacent Rudermans and D'Angelos site, thereafter accelerating to rejoin the southbound flow. In contrast to the opinion expressed by some Planning Board members, Dr. Ching preferred internal circulation between the lots of the small subdivision rather than having each lot use an entrance and exit directly from it onto the state highway. He also suggested that the possibility of obtaining state approval for a traffic light on the adjoining property be considered. He further recommended that the parking areas for the building to be constructed on Lot 1 be set off by stanchions or otherwise so that cars could not proceed directly from the parking area to and from the driveway but would be required to follow an interior route which would be more tightly controlled. 8. The Civil Engineer who prepared the site plans testified as to the design criteria used for developing the proposed drainage system. It was his intention to allow the run-off to continue as it exists at present, but to compensate for the addition of impervious surfaces by the installation of appropriate catch basins, there are no wetlands or water supplies which affect this aspect of the site plan. The septic system	design also appeared to be adequate. While the Board's decision referred to other problems of concern, including drainage, it did not further pinpoint any difficulties which it foresaw. a. The intent of a buffer area is to leave in or restore land to its natural state, to preserve or restore vegetation, to maintain or restore natural land contours, to maintain or restore visual screening. Further, the intent is to protect and preserve the value of property in the town; to preserve and protect the beauty and amenities of the town; to conserve natural conditions; to secure safety from congestion, traffic and blight; and to promote the general welfare, safety and convenience of the inhabitants of the town. Said buffer areas are not intended to be used for any purpose than above except a standing sign in conformity with the Hanover Sign Bylaw and for such area at the front of a lot which may be required for access under Section VI, G., 6. Fencing shall be allowed if it is a supplement to and not a replacement of vegetative screening and is erected at either at the lot line or at the innermost buffer area line but not within the buffer area. b. When a Business, Commercial or Limited Industrial zoned lot abuts a lot in a Residence A District, a buffer area shall be incorporated as designated above in Section VII, B., 4. and 5. These buffer areas shall be in conformity with the requirements of a buffer area as below. The entire buffer shall be within the lot in question, but may be entirely or partly within a Residence A District if such District is included within the lot confines. Wetlands may be included within the buffer area if they are not disturbed except as may be required by an order or decision of the Hanover Conservation Commission. 1. At street frontage lines, the buffer area shall be at least 20 feet in depth as further delineated in Section VI, G., 6. 2. At side and rear lines, the buffer area shall be at least 15 feet in depth. 1. When natural vegetative cover and natural contours have been preserved, the Special Permit Granting Authority may waive, in whole or in part, the strict enforcement of screening requirements if said natural screening substantially conforms to the intent of this Bylaw to the satisfaction of said Authority. 2. Street plantings shall be required and consist of grass, low ground covers and/or shrubbery and a staggered row of trees within the 20 foot area. Such trees may be planted or retained and if newly planted, shall have a minimum 2 1/2 inch trunk diameter (measured three feet above grade) and of a size, species and spacing such as to approximately meet at maturity. Species shall be common to this area and normally reach a mature height of at least thirty feet (30'). 3. The full length of side and rear buffers shall be planted (or retained) with ground-level screening which is at least 3 feet in height and which is of a species likely to reach at least 5 feet within three years. Additionally, higher screening by trees shall be provided as for street plantings except initial minimum size shall be 2" in diameter measured as above. 4. Any shrubs planted to meet these requirements shall be at least 80% evergreen and planted trees 60% evergreen. 5. Fencing may be used in conjunction with screening but not in place of it. 6. All plant materials required by this bylaw including retained vegetation shall be maintained in a healthful condition and dead materials replaced at the earliest appropriate season. These By-Law provisions were adopted after the 40 foot easement was created in 1965. In brief, the By-Law provisions require a buffer area of at least 20 feet in depth in Business Districts which do not abut Residence A Districts, and of 15 feet in depth at side and rear lines and have specific provision for screening and various required green areas. The decision of the Board did not refer specifically to this problem. Exhibit No. 15 is a landscape schematic and illustrated drawing showing the proposed buffer and screening as designed by landscape architects for the plaintiff. The access to the property as shown on Exhibit No. 15 is that of site plan No. 3. The plaintiff first argues that the site plan was constructively approved by the failure of the Board to act definitively within ninety days of the public hearing as required by Section VII, G, 4. The defendants counter that the hearing was successively continued to allow the plaintiff to file two revised plans and that the plaintiff did not object to this procedure. I would agree with the plaintiff that if, after hearing, the Board proceeds to continuously adjourn to a later date without taking final action, a persuasive argument can be made under General Laws, chapter 40A, §9, where applicable, or under a by-law provision such as Hanover's Section VII, G, 4, that the legislation is being circumvented, and the permit or approval is constructively granted. That, however, is not the present case. The hearing was continued in each instance to afford the applicant an opportunity to meet the suggestions of the Board and in each instance he attempted to do so. I find and rule that both the plaintiff and the defendant acted in good faith, that the hearing continued until November 17, 1986 and that the decision was made within ninety days thereof. I proceed then to the merits of the dispute. It had been unclear until the recent case of Prudential Insurance Co. of America v. Board of Appeals of Westwood, 23 Mass. App. Ct. 278 (1986) what standard of review was to be applied where the use of the premises was permitted as of right, but a site plan review was required by the applicable by-law. As the Appeals Court decided in SCIT, Inc, v. Planning Board of Braintree, 19 Mass. App. Ct. 101 (1984), a use permitted as of right cannot be made the subject of a special permit "as the concepts of a use of right and a use dependent on discretion are mutually exclusive," Prudential, 23 Mass. App, Ct. at 281 in reliance upon SCIT and the cases discussed therein at 110, n. 16. Therefore, in a case like the present my duty is to weigh the evidence to see if the problems with the site plans are "so intractable that [they] could admit of no reasonable solution." Id. at 283. No deference is required to be given to the Board's decision. The Board's decision specifically mentions only traffic and drainage. The deed in 1965 from Oman, Trustee, to Dubitsky subjected the locus to a forty foot right of way for the benefit of the adjoining Lot 2. This property right cannot now be affected by the Board's philosophy that the traffic on each lot would better be self-contained, a dubious proposition at best but one that need not be determined here. Cf. Dolan v. Bd. of Appeals of Chatham, 359 Mass. 699 , 701-702 (1971). The common drive, together with the existing traffic conditions on the State Highway, does present problems for the plaintiff's proposed development of the site for a permitted business use. The expert witness made valuable suggestions to improve the site plan which I adopt. These consist of: a) the use of the existing curb cut/driveway to provide access to and from the site, the adjoining property and the State Highway; b) the addition of a so-called "gum drop" island in the existing driveway to Rte. 53 (139) to prevent northbound traffic from turning left; and c) the prevention of traffic movements directly to and from parking spaces on the locus and the driveway by the installation of stanchions, internal curbing or landscaping. The Board apparently objected to the drainage provisions as they appear on the first of the plaintiff's site plans. The objections are unclear, but certainly where, as here, there are no sensitive adjoining areas or evidence of problems with the existing drainage in this area, the plaintiff has no duty to reduce the existing runoff from the site. Finally the Board made no specific mention of a buffer zone in its decision, but the issue was raised by town counsel at the trial. The plaintiff argued that the matter was not open, but in order to avoid the question arising again I note that the area of true buffer zones still is uncharted in Massachusetts law. See Farmer v. Billerica, 381 Mass. 775 (1980) (rescript), Bushmick, et al v. Woburn, Land Court Miscellaneous Case No. 103562 (Sullivan, J.; April 6, 1983), and Barletta v. Norwood, Land Court Miscellaneous Case No. 112206 (Sullivan, J.; May 2, 1985). It is unnecessary to reach the validity of the Hanover provisions in the present controversy although I note that requirements for screening along a street layout may well conflict with visibility and safety considerations, but these questions are for another day. Exhibit No. 15, if adapted to show a buffer only northerly of the right of way appears to adequately address the by-law concerns and should be accepted by the Board. The right of way, of course, is to be as created by recorded instruments and not in the location shown on Exhibit No. 15. On all the evidence I therefore remand this matter to the defendant planning board. The plaintiff is to be given thirty days again to amend his site plan in accordance with this decision and to file the revised site plan with the Board. If the plan, as so revised, is in accordance with this decision, it is to be approved by the Board. The plaintiff submitted certain requests for rulings of law and findings of fact on which I have not acted as I have made my own findings of fact, have set forth the applicable law and disposed of the action in accordance therewith. [Note 1] All recording references herein are to said Registry of Deeds.